The first EJ20 engine with turbocharger is EJ20G. This engine has DOHC cylinder heads and oil piston spray jets for cooling, low compression ratio pistons (8:1) and fuel nozzles 380cc. Bucket-style HLA EJ20G engines have lightweight valves and simple air-cooled intercooler. The power is from 220hp/6400 (Subaru WRX Wagon) to 275hp/6500 (Subaru WRX STI Version II). Engines for automatic transmission got Mitsubishi TD04 turbocharger, for manual transmission the engine was equipped with TD05. Impreza WRX STI and WRX sedan have TD05H turbocharger. The boost - 0.8 bar (WRX 240hp and WRX STI version I, 250hp), 0.87 bar (STI version II, 260hp), 0.93 bar (STI version II, 275hp). The shim-over-bucket style EJ20G engine was installed in Japanese Impreza WRX or European 1997-1998 Impreza Turbo. The new turbo motor EJ20K came out in 1996. It has a redesign intake manifold, bigger intercooler, new pistons (8:1 compression ratio), fuel nozzles 505 cc and new engine control unit. For Subaru WRX, the engine was equipped with the TD04 turbocharger, Subaru WRX STI - IHI RHF5HB turbocharger (1.07 bar). In 1998, as naturally aspirated engines, the manufacturer started producing the Phase II engines: EJ205 for Impreza WRX and EJ207 for Impreza WRX STI. These engines have new cylinder heads with redeveloped intake channels, lightweight pistons. Camshafts specs for both engines: phases 256/256, valve lift 9.27/9.17 (8.25/8.61 for JDM cars). Impreza WRX EJ205 engine turbochargers are TD04 (1.0 bar). The EJ205 engine for Impreza II was equipped with variable valve timing system AVCS on intake camshafts and TGV system (Tumble generator valves) in the intake manifold for reducing emissions. Compression ratio is 9:1 for this motor. 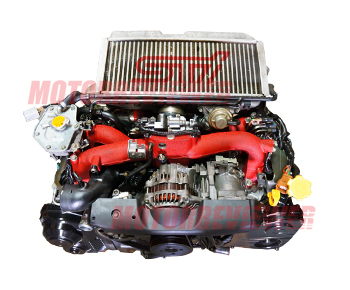 The EJ207 engine for STI has its pistons (8:1 ratio) and turbocharger. STI GD used IHI VF30 (VF35 for JDM WRX Type RA) which blows 1.1 bars. WRX STi Spec C Type RA has IHI VF34. From 2003, STI has VF37. VF42 was installed on the EJ207 engine for WRX STI S203 and S204. Every STI engine has forged pistons. The new 2.0-liter FA20DIT engine replaced turbocharged EJ20 engines. Oil consumption. The reason is stuck rings. That is very common for turbocharged EJ20. It is highly recommended to use high-quality engine oil and fuel. The EJ20 turbo engine is more reliable than 2.5-liter turbo engine due to thicker sleeves and better cooling of a cylinder block.